Color A: C/O 36 stitches and join, being careful not to twist. Knit 5 rounds in 2 x 2 Twisted Rib. Color A: knit 5 rounds in 2 x 2 Twisted Rib. Cut yarns and weave in ends. Place around take out coffee cups to help protect fingers and hands from heat. Thanks for the pattern. 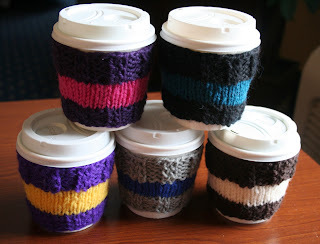 I've thought about making a knit paper cup sleeve many times but never got around to sitting down to do it. I'll be sure and give you credit Cathy. I made a bunch of something very like this for this past Christmas. 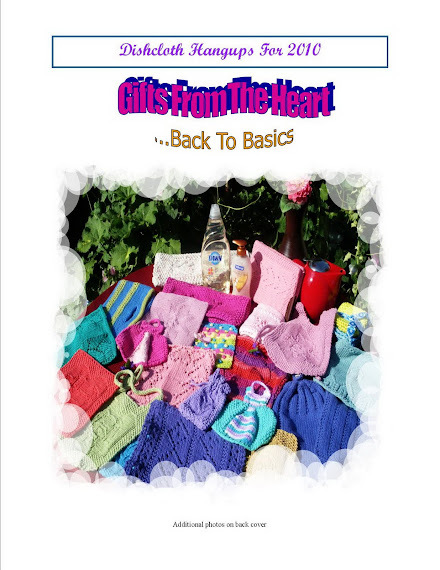 Then I got gift cards and cups at a coffee shop, filled the cups with some goodies like homemade chocolate covered spoons, some cookies and candies and a packet of hot cocoa and gave them to all f the nieces and nephews for their gifts this year. Worked out great! Those are really cute. Thanks for the pattern.